It’s important to teach your kids about money. Growing up, I was not taught anything about how to handle my finances. This led to me making many mistakes. If you were to Google “what not to do with money” you would find my decisions. One example is the first big purchase my husband and I made—we bought a car. It was impulsive and uninformed, and we were not prepared. We bought the first car we test drove, at the first dealership we visited, without a pre-approved loan or any knowledge of how to buy a car. It was definitely a learning experience, and an experience we regret. It’s important to educate your kids so they do not make these mistakes. Starting early will give your child the benefit of becoming a successful money manager. Children in preschool are able to understand the basics of money. At this age, try talking to your children about how you plan purchases. Discuss with them that you have to work to make money to buy things. Another important lesson is how to handle delayed gratification. Prepare them when you are going into a store, by telling them exactly what you are going to buy. It will save you the drama of disappointment, when your child understands that going to the store does not always mean getting something. Going in with a list helps both you and your child. As your child gets older, you can explain why you chose one product over another, based on price and quality. According to this CNBC article, one study has shown that the earlier a child starts a business the more successful they will be. Warren Buffet, one of the world’s most famous billionaires, began his first business selling canned cokes for a nickel at the age of six. Don’t discourage your child who has ideas of going door to door selling things. This is the beginning of entrepreneurship. Teaching your child that goods cost money is the first step. You can begin by playing pretend grocery store in your living room or having an imaginary restaurant at home. Your kids can learn how to set the table and at the end of dinner someone has to pay the check. Whether you give allowance or not, develop some form of currency your child can use with you. One idea is to create three jars, one for spending, one for saving, and one for giving. You can use real money or play money based on your own preference, but develop realistic ways for your child to earn it, spend it, and give it. The spend jar will be for small everyday purchases like candy, pencils, or stickers. The savings jar is for those bigger purchases your child may want to make, such as a more expensive toys or video games. The giving jar is one where your child can choose an organization, a friend in need, or another cause to share their resources with. Make sure your currency is relative to your child’s age and goals. It could be discouraging if they earn a quarter a week and want to buy a toy that cost $20. Help set realistic goals. Once your child is old enough for an allowance, it’s a good idea to start a savings account. A study done on a classroom of fifth graders showed that once they were given the option to put their money in a savings account they were more likely to save it. Bank accounts give them a sense of responsibility and ownership. Creating a savings account also helps children become more financially aware. It reminds them to plan for their future and sets them up for success. According to Learnvest.com, research in 2011 from the Center for Social Development at Washington University in St. Louis suggests that college savings accounts containing as little as $1 result in students being up to seven times more likely to attend college. For children in lower- to middle-income families, these accounts make them feel that a college education is really possible. Not only are they more likely to attend college, they are more likely to graduate. 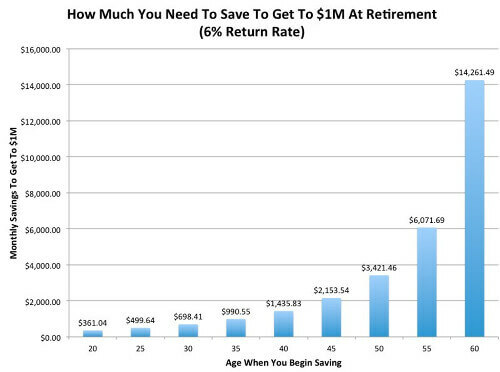 If you want a nice visual to help drive this point home, consider a graph like this that shows how much easier it is to save money when you start early. Maybe you can make a version that goes to an even younger age. When you start talking about becoming a “millionaire,” you will have your kids’ full attention. Children learn primarily from the influences in their home. It is important for you to make sure you are making wise choices with your money, because children will mimic the behaviors they see. A good place to start is creating a budget. You can use it to help you create a spending plan and give every dollar you make a purpose. Once you do this, you will see where your money is going. Securing your future is important for you and your children. Start your own savings account for emergencies, big purchases, and retirement. Don’t forget to share with your children how you spend, save, and give. If you feel like you need help creating a financial plan, you can use many of our financial tools. We have a budget calculator that will get you started. If you are struggling financially we also offer free budget and credit counseling. It’s never too late to begin making smart financial decisions! Want more help with your budget? Try our free and easy to use budget calculator.